Deck the Halls with Boughs of Holly, Applebee's® Announces December DOLLAR JOLLY! GLENDALE, Calif., Nov. 30, 2018 /PRNewswire/ -- The Applebee's® December Neighborhood Drink of the Month, the DOLLAR JOLLY, has come to town – one day early. Starting today at participating Applebee's restaurants nationwide, celebrate the spirit of the season, with this vodka-based cocktail cheerily crafted with Cherry or Green Apple JOLLY RANCHER mix for just one dollar. A JOLLY RANCHER hard candy is served on the side as an extra jolly treat. For the first time ever, Applebee's has joined forces with JOLLY RANCHER, makers of the popular, bold, fruit-flavor hard candy, to offer two festive flavor options for its Neighborhood Drink of the Month. 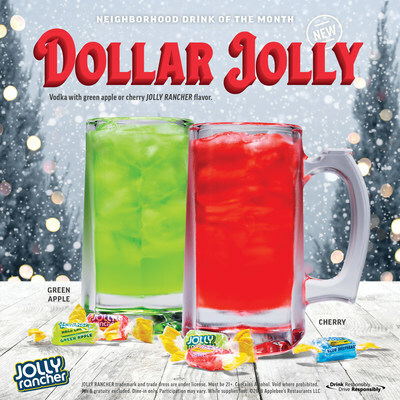 The DOLLAR JOLLY will be available in two flavors in the colors of the season, Cherry and Green Apple, with each sweet sip bringing good tidings to all who taste. "We created a drink to help spread the cheer as friends and loved ones gather together during the holidays," said Patrick Kirk, vice president of beverage innovation at Applebee's. "The DOLLAR JOLLY embodies the holiday spirit: joy, delight and good times. Oh, and vodka too." If you haven't quite finished your Christmas lists, you can do so today at Applebees.com. With the purchase of a $50 Applebee's Gift Card, you'll also receive a $10 Bonus Card that you can gift or keep for yourself. There are two ways to send this season's most rewarding gift – by mail or by digital gift card. Visit applebees.com/gift-card to purchase your gift cards today. For more information on Applebee's Gift Cards, the December Neighborhood Drink of the Month and other limited time offers from Applebee's, visit Applebee's online. Applebee's Neighborhood Grill & Bar offers a lively casual dining experience combining simple, craveable American fare, classic drinks and local drafts. All Applebee's restaurants are owned and operated by entrepreneurs dedicated to serving their local communities, and offering quality food and drinks with genuine, neighborly service. Applebee's is one of the world's largest casual dining brands; as of September 30, 2018, there were 1,875 Applebee's franchise restaurants in all 50 states, Puerto Rico, Guam and 13 other countries. Applebee's is franchised by subsidiaries of Dine Brands Global Inc. [NYSE: DIN], which is one of the world's largest full-service restaurant companies.